Greetings, Kappnists! 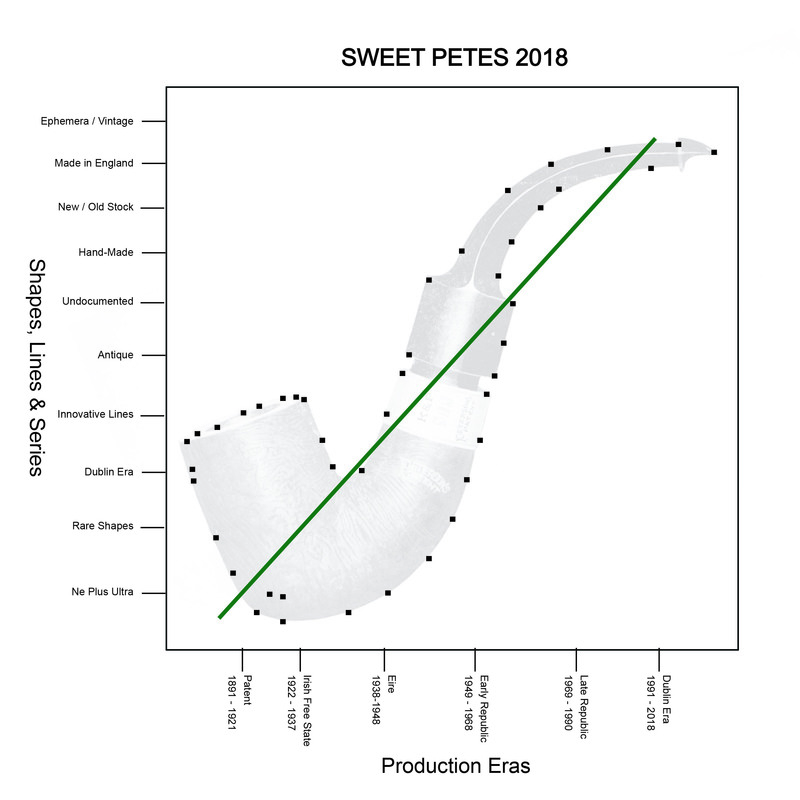 * For the past few years I’ve enjoyed beginning the new year with a look back at the previous year’s “Sweet Petes”—pipes that have come across my path in the course of research, conversation or acquisition. From the collector’s point of view, one of the best-kept secrets about Peterson is just how much territory goes into this terrain. As the faux-scatterplot illustrates, there are not only six discreet eras of Peterson pipes, with peculiar idiosyncracies to each, but a wide spectrum of categories: rare shapes, English factory pipes, factory hand-mades, antiques, System lines and permutations, extreme high-grades, forgotten and undocumented lines, new / old stock and unsmoked pipes accompanied by their original ephemera of boxes, brochures, guarantees and even gratis pipe tools. While the book has been printed and is en route from Beijing to Hong Kong to Seattle, I’m finding that there remains a wealth of Peterson information to be recovered, discovered and shared, all of it outside the book’s scope. Maybe Peterson Pipe Notes should be called The Peterson Arcana. Whatever it’s called, I hope this will continue to be a good place to celebrate and promote one of the great marques of briar pipe history. And in that spirit, what follows is a “scatterplot” of my 2018 Pete pilgrimage. As you’ll see, it’s not so much a mathematical diagram of Cartesian coordinates displaying value along two vectors—production eras and lines—as it is a look at what can be found when geeking out about “the world’s oldest briar-pipe making business in continuous production” —as my co-author and I were able to document in The Peterson Pipe. As the brand continues to gain interest among pipe smokers, I think we can expect not only to see estate prices rise, but see more old Petes recovered. The “Indiana Jones” of Peterson artifact research, for my money, is my co-author Gary Malmberg. He’s bringing several treasures unearthed since the 2018 Chicago show to the book launch in 2019, including the unsmoked 4s from 1894 seen above! And we’re negotiating with Peterson to bring a few treasures of their own, which should make this year’s display of historic Petes the best ever seen in one place at one time. Tucked away in Steve Dundish’s massive 999 collection last year were two pipes I thought I’d never see, both specimens of what I’m fairly certain is the rarest of all production shapes, the 999 author. The shape was made during the early days of “the Emergency,” or what the rest of the world called WWII, probably around 1940 or so. Steve acquired both a Shamrock line version and the Captain Pete version pictured here. You’ll be able to take a closer look at the Captain Pete at the Chicago show in May. 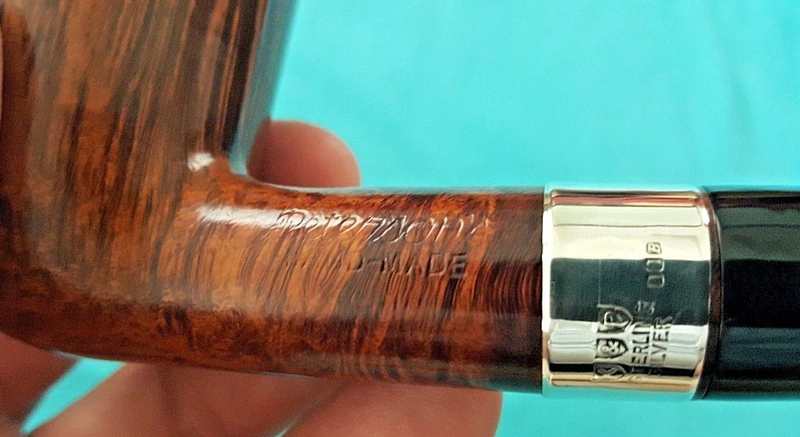 The Dublin Edition US-only line, in sandblast, rustic and smooth with vulcanite mouthpieces in saddle or taper and nickel bands, quietly slid onto the market in 2018, with no announcement from Peterson nor any attention from anybody else. Which is a shame, really. Aside from the Aran line, I’ve never smoked any of Peterson’s entry lines, but the value (at about $75) seems pretty sweet, and the line, especially in its blast and rustic versions, is quite fetching. Even though the System Spigot did not enter the official Peterson System ranks, being one of the annual spigot lines that disappears after 18 to 24 months, the idea behind it was sound: take the world’s best-smoking factory pipe, which also happens to be the world’s strongest pipe, and make it stronger. Voilà! The System Spigot. Per factory manager Joe Kenny, bowls from the line are of the same grade as the Standard System line, the higher price of the System Spigot stemming from its combination sterling ferrule and spigot. And yes, it honors Charles Peterson’s three patent elements: vulcanite P-Lip, graduated bore and reservoir, so it’s a true System. The chestnut stain is something new for System devotees, and while it doesn’t have a Premier-quality bowl nor the Premier’s tenon extension, it’s still an amazing line for System aficionados. For those who might be on the fence, I might add that from an engineering standpoint, the metal-against-metal connection of ferrule and spigot—since both pieces conduct heat at the same rate—makes for an air-tight seal, enhancing performance. I think Charles Peterson would have approved. A paradigm shift for Pete freeks came in June of 2018 with the passing of Tom and Conor Palmer’s “Dublin Era” (1991-2018), which we celebrate in full in the Peterson book. As close observers may have noticed, the company’s design work subtly changed after Conor Palmer became commercial director. He was developing a new direction in Peterson’s house style, one which maintained the broad outlines of the house style but was adapting itself to the times. Conor’s 2018 SPD, even compared against the great first issue of 1998, is arguably the finest in the long history of the series. While not a pipe smoker, Conor was eager to learn from his customers about what goes into the engineering of a great pipe and was beginning to make strides to that end before his departure. 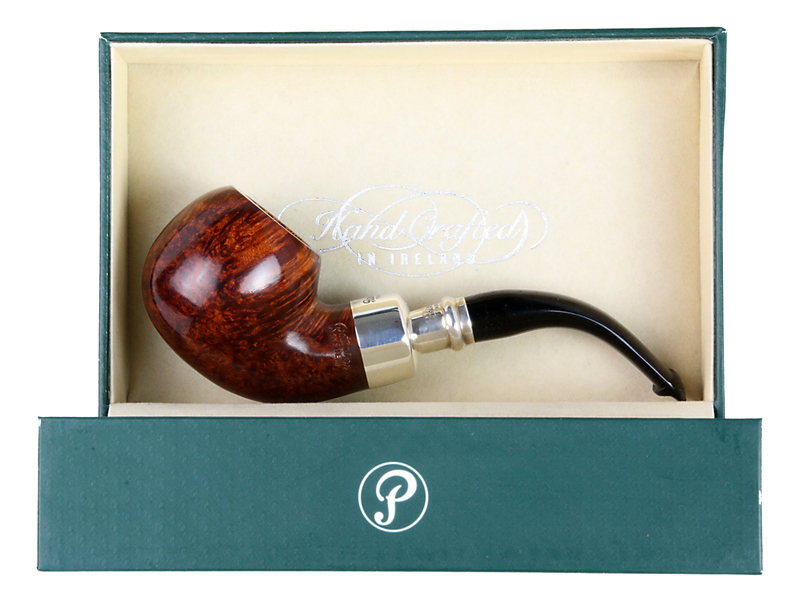 His 2018 POY (“the Gaslight”) was also quite an achievement, one of the high points in the 20+ years of Peterson’s Pipe of the Year designs, certainly on a par with most of the pipes Tom released, with a slender, wide acrylic mouthpiece that is the most comfortable acrylic the company has yet released. 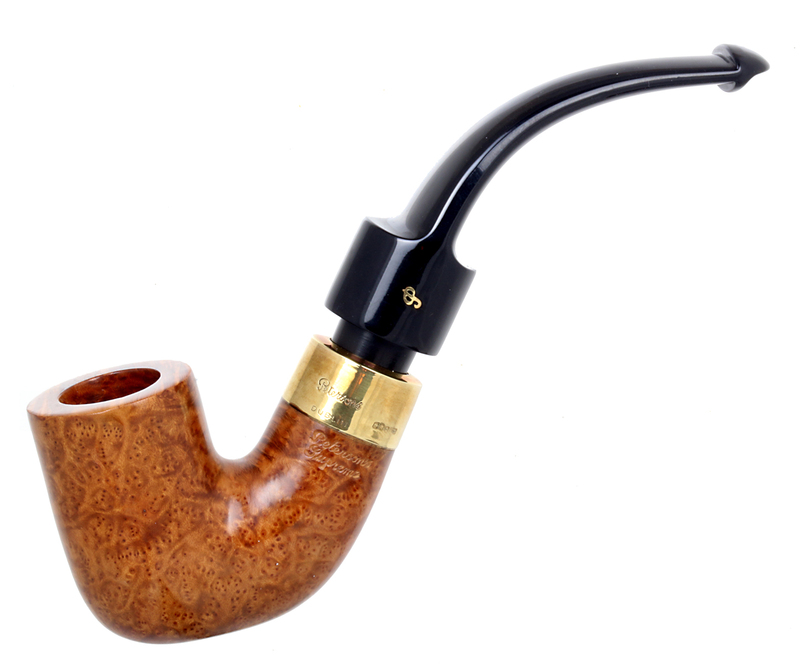 The oval shank is also amazing, and the fantastic, short chimney v-shaped chamber simply clamors for virginias and vapers. 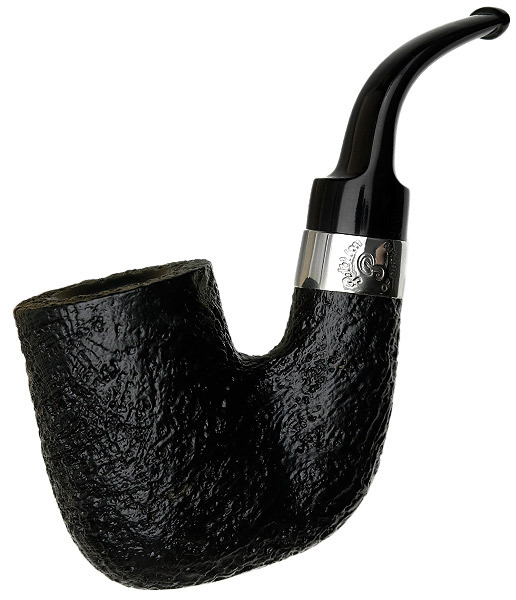 When I was in high school, after a few basket pipes and a Jobey Stromboli, my next major pipe purchase was a GBD prince churchwarden, $12.50 in those days. 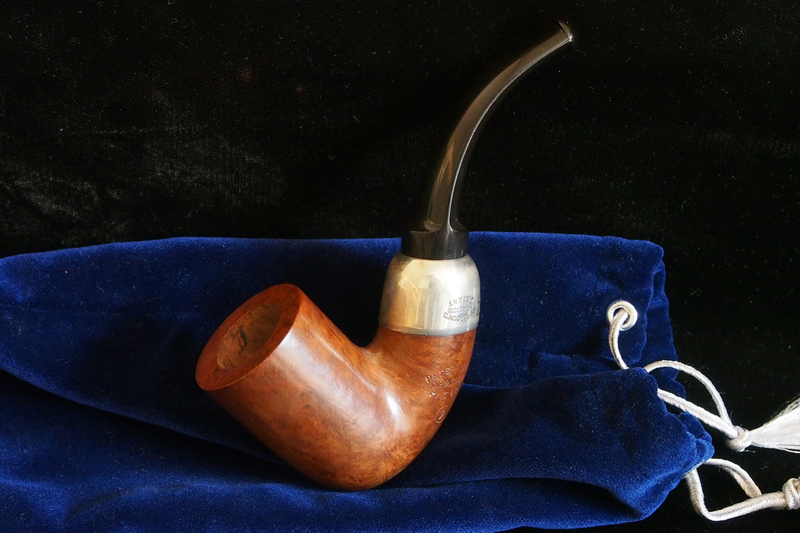 As a new pipe smoker, I’m sure I wasn’t much different than a lot of others—the churchwarden was exotic, it was romantic, but most of all, it reminded me of hobbits, who had inspired me to smoke in the first place. That pipe is long gone from my racks, but I’ve always had a great respect for these long pipes, and after smoking a Patent-era System with a “house pipe” mouthpiece not too long ago, I know the experience is quite different than a shorter pipe. I’ve only seen a few of these Spigot Churchwardens as of yet on the marketplace. 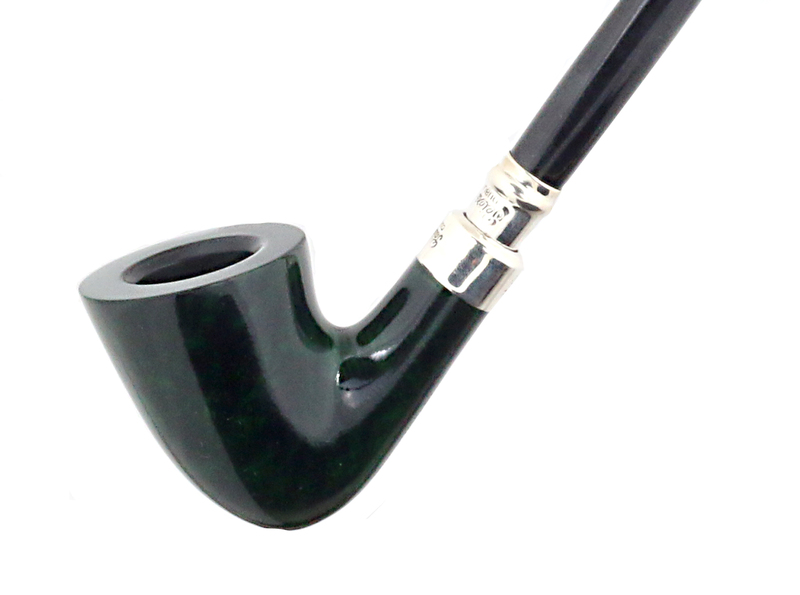 At $160 or so, they run almost double the normal sterling band churchwarden, but the spigot and the dark green stain certainly give this venerable Peterson line (which dates to the late 1940s) an elegant panache. One of my favorite areas of arcane Peterson lore has to do with obscure and long-gone lines, and at the top of that list is the MADE IN ENGLAND Trafalgar Square. This example—is it a natural finish?—is shape N 46, a classic, full-size English bulldog. The restoration was done by a real master, Joe Mansueto. And in case you’re wondering, no, the mouthpiece didn’t have that clever bend—that was Joe’s idea. But if Lesley Starr or the other hands at the White Lion factory in London had seen it, I’m sure they would’ve smiled. How Joe managed to get that obsidian black mouthpiece and retain the square white emblem on the stem is beyond me—trade secret, I’m sure. We document the Trafalgar Square line, as well as talk about the London factory, in the book. But what I’m still looking for is a Peterson English factory shape chart—something for my next Peterson pilgrimage. The English System line carries the same numbering line as the Irish, as do many of the Classic Range “Made in England” pipes. But not so with the Trafalgar Square: notice the shape number begins with an “N.” The TS pipes we’ve documented so far also include dark sandblast finishes. I had originally thought to write a separate post on how to determine whether a Pete is actually hand-made at the factory, and not only hand-made, but made by Paddy Larrigan. And I may still when I get a bit more information. But in the meantime, not to keep you wondering, if you spot an XL pipe stamped HAND-MADE, other than the large House Pipe billiard and bent System, you are probably looking at a pipe made by Paddy Larrigan, or possibly his contemporary, Frank Brady. Both men were factory managers at one time or another, both did pipe repair, shaping, sanding and all the other jobs that go into making a factory pipe. And they both were capable artisans by the standards of their day and could hand-turn both bowls and mouthpieces, sometimes for customers visiting the factory and sometimes on commission through mail order. 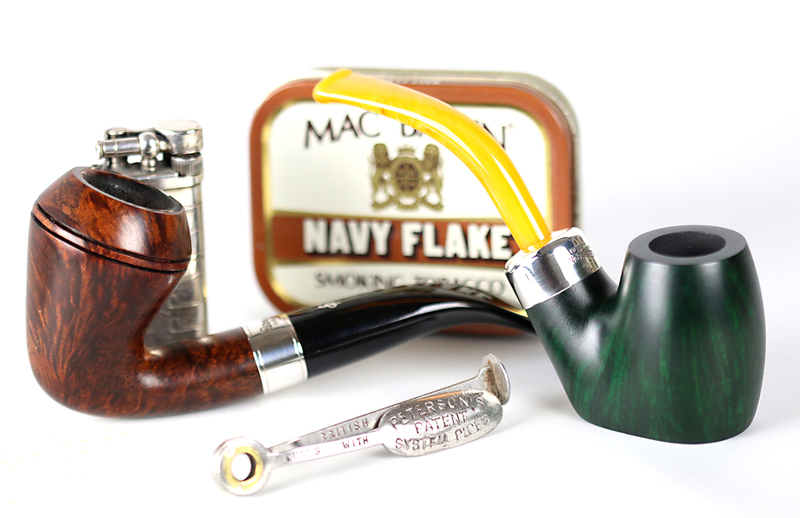 The standards weren’t what we routinely expect from artisan pipes today, and you will sometimes see a few fills. This had more to do with the nature of of the wood and constraints of time than anything else. One thing that bothered Paddy more than anything else, he told me in 2013, was spending several hours shaping a bowl only to have it go all to hell on him just as he was getting it close to completion. (Remember that in a factory, the goal is to use every piece of briar the company buys.) The XL-sized dublin pictured above, never smoked, is an example of what happened when thing went smoothly—a Pete Geek was touring the factory in the mid-1990s, asked if Paddy could make a pipe for him, and a few days later returned to pick up this great piece, which he could never afterwards bring himself to smoke: fantastic grain, incredible shaping, all cut and shaped by Larrigan himself. Last year in the course of a search for one of Peterson’s earliest advertisements for the De Luxe line (and the very last discovery to find its way into the book), I was emailing back and forth a bit with Mario Lubinski (Peterson’s Italian distributor). In the course of our conversation I asked about the mid-1980s Kapp-Royal Italian line, and in his response, Mario not only sent catalog pages of the Kapp-Royal, but also talked about another line which he revived and marketed at approximately the same time, the Wicklow (c. 1987). 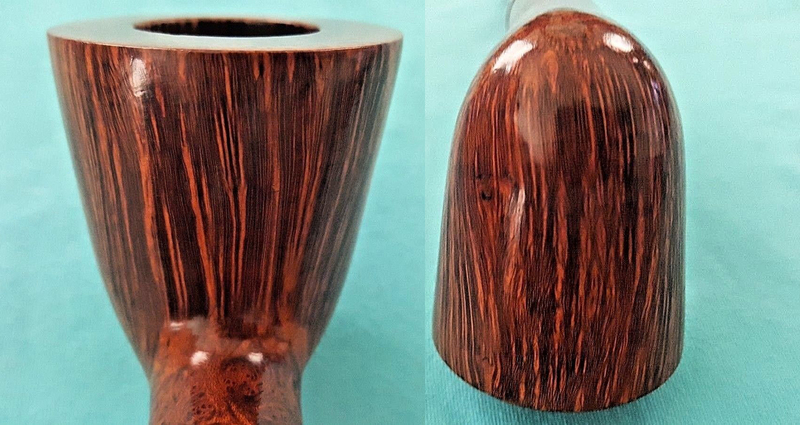 While the Wicklow (documented in the Peterson book) was a fairly standard mid-grade Peterson Classic Range line, Mario enthused about several forgotten shapes that have since disappeared from the catalog. 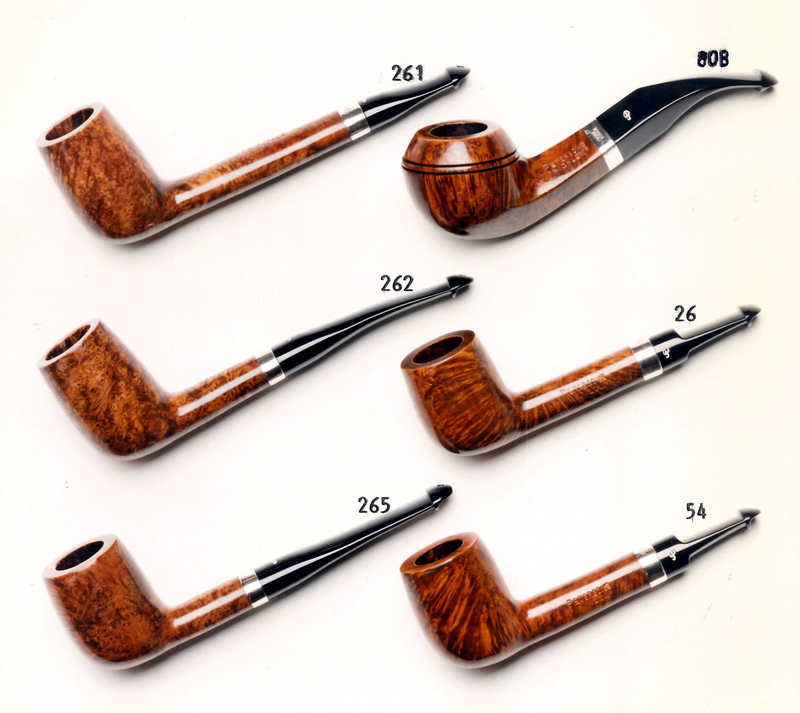 The 80B (for tapered) has appeared on and off since then, but the other five shapes seen above have not, and there’s some real beauties here: the long 261 Belge-Canadian; the 262, which is the same bowl with a shorter shank and that incredibly Irish 1/16th bent mouthpiece; the slender, bing-like 265 billiard; and Mario’s two personal favorites, the 26 and 54 lovats. I’ve only seen the 261 once on the estate market, and that in an early 1990s Peterson Danish-market line (it’s sitting comfortably in my rack now). With Peterson as with the rest of culture, sometimes you don’t have to go all that far back to find something you’ve never seen before. 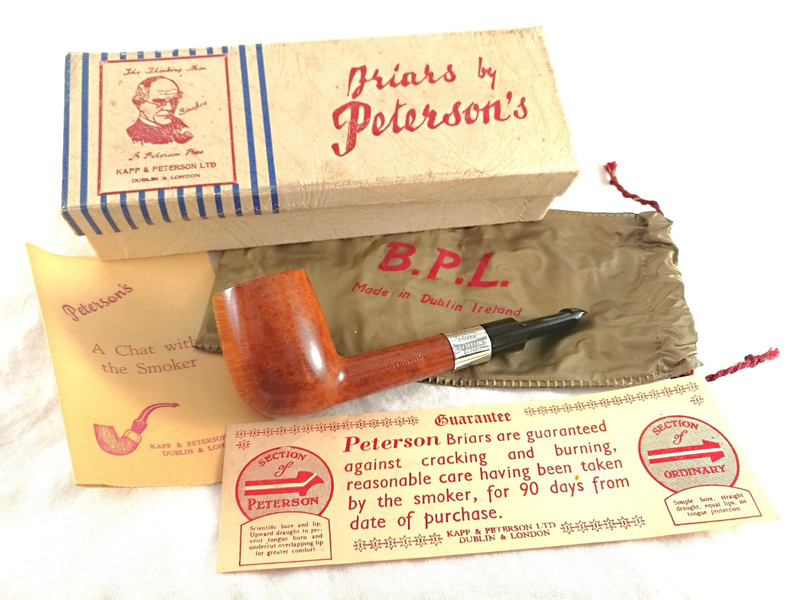 I can’t end a Sweet Petes post without at least one mention of The Great Shape, aka “The Thinking Man’s” pipe, the 4s / 309. This one was found somewhere in a dark cabinet at Tabaccheria Rizzi’s, a venerable, small Italian tobacconist that goes back through father and son to the 1960s. This 4s Supreme is an example of Peterson’s art at its highest water mark in the late 1970s, putting current Supremes (as scarce as they are) to shame. 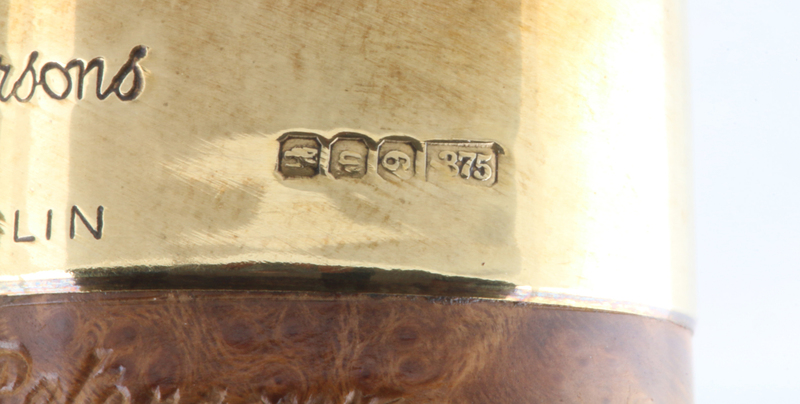 From left to right, the first mark is Hibernia Seated (symbolizing Ireland); the second, the lower-case “n,” is for 1979; the third, “9” signifies 9-karat gold; and the fourth, 375, the purity of the gold.